Finance Your Dream Kitchen Today! In our most previous blog, we covered some common signs that you’re due for a remodeled kitchen. Kitchens play a vital role in a house, as it is the most used room. However, what about the other important rooms, shouldn’t they be remodeled too? For the amount of time that is spent in them, bathrooms are often overlooked when it comes to remodeling within a household. Usually, homeowners invest in a remodeled kitchen because kitchens are a huge deciding factor for those who are house hunting. However, when house hunters come across a beautiful bathroom, it is something that is hard for them to forget. If you’re on the fence about remodeling your bathroom, whether it’s in preparation for selling your home or you’re just tired of having a basic, boring bathroom, here are some great reasons why you may be ready for a bathroom remodel. You have scarce storage space. When you think of a room in your house where storage space is essential, your mind is probably immediately drawn towards garages or closets. However, bathroom storage can be beneficial to an extent. If your bathroom is cupboard-less, then adding storage space is crucial to your bathroom remodel. Not only will you no longer have to have stacks of towels on the floor or on the back of the toilet, but your bathroom will become more comfortable for you and guests as there will be much less clutter. Increased property value. As we mentioned earlier, home buyers will notice a beautiful bathroom. Because of this, a bathroom model can increase the value of your home. A beautiful, modern bathroom will attract buyers, especially those who don’t have the time or budget to do a remodel themselves. Whether you’re planning to sell your home or not, it’s better to be prepared — and, you’ll truly appreciate the upgrade. The layout is impractical. Poorly designed bathrooms can be a pain. Having a sink right next to the shower will only cause frustration. If you find yourself feeling cramped due to a poorly designed bathroom, then changing the layout is crucial during a remodel. While bathroom layouts mainly depend on preference and needs, it is recommended to have easy access to the most used features. In addition, places fixtures against the walls when applicable will help open up more space. Even if you have a small bathroom, creating a new layout during the remodeling process will make your bathroom seem noticeably larger. You desire more aesthetic appeal. If you live in an old home, although they can be appealing, they can also be very dreadful. Bathroom carpeting is a long-outdated trend, and if you still have the same fixtures that came with the home, you may be long overdue for a bathroom remodel. A remodel can easily transform an old-style lavatory into a sleek, comfortable bathroom. Your plumbing isn’t getting the job done. Speaking of outdated fixtures, the condition of your plumbing may suggest you need to invest in a bathroom remodel. The plumbing in the bathroom keeps everything running smoothly — can you imagine life without it? Yuck. Over time, plumbing will begin to deteriorate and become inefficient, starting to cause issues. From clogged toilets to major flooding, inefficient plumbing is something you should never want to experience. A bathroom remodel is a great opportunity to update the plumbing, as well as the bathroom aesthetic. The bathroom tile is worn. If your bathroom has tile flooring, you will eventually find (or already have) that the tile wears overtime. The daily use of bathrooms causes a lot of wear and tear to the flooring, causing it to lose its appeal. With a bathroom remodel you have the opportunity to choose tile you find appealing. Updating the flooring will not only increase the value of the bathroom and your house, but will give the flooring new life! You’ve outgrown the space. Maybe your bathroom started as a quaint and cozy area, but has not become a stinky, crowded area. A bathroom remodel can create more room and eliminate chaos, especially for those who share a bathroom with one or more people. Your bathroom is an energy hog. If you have old lighting and appliances, there’s a good chance the use of your bathroom consumes a lot of energy. Today, there are various options available to make your bathroom energy efficient. Simple updates to the lighting and water fixtures can end up saving you money and is better for the environment. You have no safety features. Did you know that bathrooms are one of the most common places for in-house injuries? From falling in the shower to slipping on the wet floors, the use of safety features should be utilized to create a safer environment. There are many ways you can add safety features to your bathroom, like installing a handlebar in the shower. You have outdated countertops. If you weren’t aware already, laminate countertops haven’t been appealing for quite some time now. And, whether you have countertops or a vanity, installing new, modern countertop designs will instantly make your bathroom feel more luxurious and comfortable. There are many styles to choose from, like granite, marble, quartz, and decoran, so choose something that you find appealing and that will complement the fixtures in your bathroom. If you can relate to any of the reasons above when it comes to your bathroom, you may want to consider investing in a bathroom remodel. When you’re ready to upgrade your bathroom and are in need of bathroom countertops, contact Fiberpol! 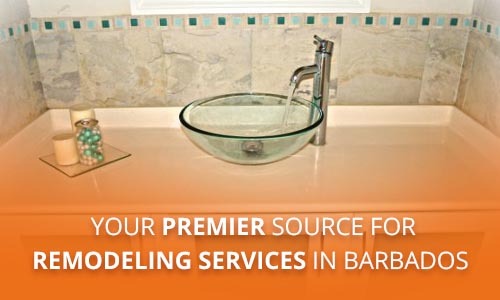 Fiberpol is Barbados’s premier choice for remodeling services. Our catalog features modern and trending countertop styles. 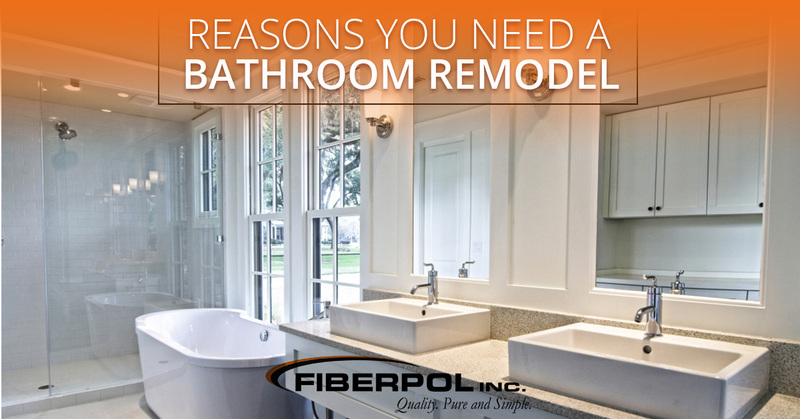 To schedule a free consultation, contact the remodeling experts at Fiberpol! ©2019 Fiberpol Inc. | Do not copy. All rights reserved.